Definition at line 88 of file cfpython.c. Referenced by closePlugin(), getPluginProperty(), initPlugin(), and registerCommand(). Definition at line 68 of file cfpython.c. Referenced by closePlugin(), compilePython(), and postInitPlugin(). Definition at line 67 of file cfpython.c. Definition at line 947 of file cfpython.c. Definition at line 575 of file cfpython.c. References cf_add_string(), MAX_REPLIES, talk_info::replies, talk_info::replies_count, talk_info::replies_words, set_exception(), and _cfpcontext::talk. Definition at line 979 of file cfpython.c. Definition at line 1590 of file cfpython.c. References _cfpcontext::activator, cf_get_maps_directory(), cf_log(), Crossfire_Map_wrap(), Crossfire_Object_wrap(), do_script(), _cfpcontext::event, EVENT_BORN, EVENT_CLOCK, _cfpcontext::event_code, EVENT_CRASH, EVENT_GKILL, EVENT_KICK, EVENT_LOGIN, EVENT_LOGOUT, EVENT_MAPENTER, EVENT_MAPLEAVE, EVENT_MAPLOAD, EVENT_MAPRESET, EVENT_MAPUNLOAD, EVENT_MUZZLE, EVENT_PLAYER_DEATH, EVENT_REMOVE, EVENT_SHOUT, EVENT_TELL, freeContext(), getGlobalEventPath(), Handle_Map_Unload_Hook(), llevDebug, _cfpcontext::message, pl::ob, _cfpcontext::options, popContext(), _cfpcontext::returnvalue, _cfpcontext::script, snprintf, _cfpcontext::talk, _cfpcontext::third, and _cfpcontext::who. Set up the various types (map, object, archetype and so on) as well as some constants, and Crossfire.error. Definition at line 1306 of file cfpython.c. References CFPythonError, CFPythonMethods, Crossfire_ArchetypeType, Crossfire_MapType, Crossfire_ObjectType, Crossfire_PartyType, Crossfire_PlayerType, Crossfire_RegionType, initcjson(), llevDebug, llevError, llevInfo, and llevMonster. Open a file in the way we need it for compilePython() and postInitPlugin(). Definition at line 755 of file cfpython.c. Referenced by compilePython(), and postInitPlugin(). Definition at line 777 of file cfpython.c. Definition at line 1480 of file cfpython.c. References _cfpcontext::activator, cf_get_maps_directory(), cf_log(), Crossfire_Object_wrap(), current_command, do_script(), _cfpcontext::fix, freeContext(), llevError, _cfpcontext::message, _cfpcontext::options, popContext(), _cfpcontext::returnvalue, PythonCmdStruct::script, _cfpcontext::script, snprintf, _cfpcontext::third, and _cfpcontext::who. Definition at line 817 of file cfpython.c. References pycode_cache_entry::cached_time, cf_add_string(), cf_free_string(), cf_log(), cfpython_openpyfile(), cfpython_pyfile_asfile(), pycode_cache_entry::code, pycode_cache_entry::file, llevDebug, log_python_error(), PYTHON_CACHE_SIZE, and replace(). Definition at line 653 of file cfpython.c. Definition at line 144 of file cfpython.c. Definition at line 152 of file cfpython.c. Definition at line 229 of file cfpython.c. Definition at line 475 of file cfpython.c. Definition at line 906 of file cfpython.c. References compilePython(), log_python_error(), pushContext(), and _cfpcontext::script. Referenced by cfpython_globalEventListener(), cfpython_runPluginCommand(), and eventListener(). Definition at line 535 of file cfpython.c. Definition at line 491 of file cfpython.c. Definition at line 199 of file cfpython.c. References cf_player_find(), Crossfire_Object_wrap(), and pl::ob. Definition at line 744 of file cfpython.c. References _cfpcontext::activator, _cfpcontext::event, _cfpcontext::third, and _cfpcontext::who. Definition at line 342 of file cfpython.c. References cf_archetype_get_first(), cf_archetype_get_next(), and Crossfire_Archetype_wrap(). Definition at line 164 of file cfpython.c. Definition at line 253 of file cfpython.c. Definition at line 265 of file cfpython.c. Definition at line 315 of file cfpython.c. Definition at line 407 of file cfpython.c. References cf_friendlylist_get_first(), cf_friendlylist_get_next(), and Crossfire_Object_wrap(). Definition at line 1582 of file cfpython.c. Definition at line 257 of file cfpython.c. Definition at line 241 of file cfpython.c. Definition at line 483 of file cfpython.c. References cf_map_has_been_loaded(), Crossfire_Map_wrap(), and PythonCmdStruct::name. Definition at line 368 of file cfpython.c. References cf_map_get_first(), cf_map_get_map_property(), CFAPI_MAP_PROP_NEXT, and Crossfire_Map_wrap(). Definition at line 551 of file cfpython.c. Definition at line 381 of file cfpython.c. References cf_party_get_first(), cf_party_get_next(), and Crossfire_Party_wrap(). Definition at line 567 of file cfpython.c. Definition at line 261 of file cfpython.c. Definition at line 355 of file cfpython.c. References cf_object_get_object_property(), CFAPI_PLAYER_PROP_NEXT, and Crossfire_Object_wrap(). Definition at line 324 of file cfpython.c. Definition at line 394 of file cfpython.c. References cf_region_get_first(), cf_region_get_next(), and Crossfire_Region_wrap(). Definition at line 170 of file cfpython.c. Definition at line 303 of file cfpython.c. Definition at line 307 of file cfpython.c. Definition at line 543 of file cfpython.c. Definition at line 337 of file cfpython.c. Definition at line 249 of file cfpython.c. Definition at line 455 of file cfpython.c. References cf_get_time(), _timeofday::day, _timeofday::dayofweek, _timeofday::hour, _timeofday::minute, _timeofday::month, _timeofday::periodofday, _timeofday::season, _timeofday::weekofmonth, and _timeofday::year. Definition at line 245 of file cfpython.c. Definition at line 559 of file cfpython.c. Definition at line 296 of file cfpython.c. Definition at line 269 of file cfpython.c. Definition at line 278 of file cfpython.c. Definition at line 287 of file cfpython.c. Definition at line 1389 of file cjson.c. Referenced by cfpython_init_types(), and initPlugin(). 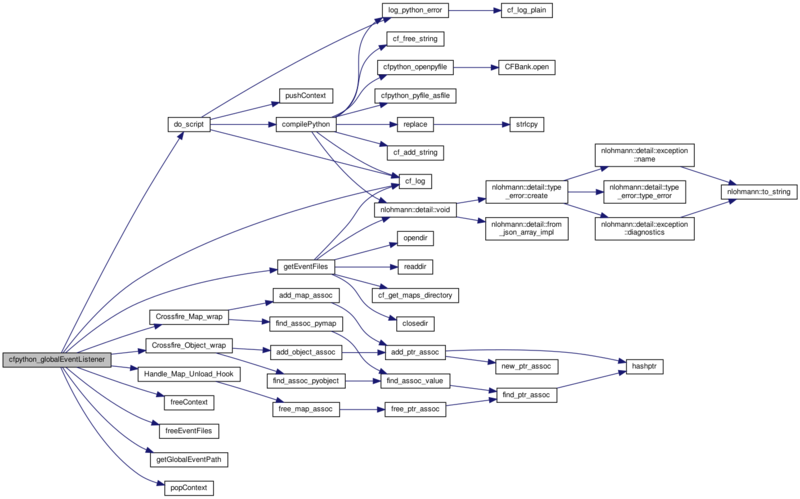 Definition at line 995 of file cfpython.c. References addConstants(), addSimpleConstants(), ALLRUN, ALTAR, AMULET, ARMOUR, ARMOUR_IMPROVER, ARROW, AT_ACID, AT_BLIND, AT_CANCELLATION, AT_CHAOS, AT_COLD, AT_CONFUSION, AT_COUNTERSPELL, AT_DEATH, AT_DEPLETE, AT_DISEASE, AT_DRAIN, AT_ELECTRICITY, AT_FEAR, AT_FIRE, AT_GHOSTHIT, AT_GODPOWER, AT_HOLYWORD, AT_INTERNAL, AT_LIFE_STEALING, AT_MAGIC, AT_PARALYZE, AT_PHYSICAL, AT_POISON, AT_SLOW, AT_TURN_UNDEAD, AT_WEAPONMAGIC, ATNR_ACID, ATNR_BLIND, ATNR_CANCELLATION, ATNR_CHAOS, ATNR_COLD, ATNR_CONFUSION, ATNR_COUNTERSPELL, ATNR_DEATH, ATNR_DEPLETE, ATNR_DISEASE, ATNR_DRAIN, ATNR_ELECTRICITY, ATNR_FEAR, ATNR_FIRE, ATNR_GHOSTHIT, ATNR_GODPOWER, ATNR_HOLYWORD, ATNR_INTERNAL, ATNR_LIFE_STEALING, ATNR_MAGIC, ATNR_PARALYZE, ATNR_PHYSICAL, ATNR_POISON, ATNR_SLOW, ATNR_TURN_UNDEAD, ATNR_WEAPONMAGIC, BATTLEGROUND, BLINDNESS, BOOK, BOOTS, BOW, BRACERS, BUILDER, BUTTON, CF_HANDLE, CHECK_INV, CIRCLE1, CIRCLE2, CLASS, CLOAK, CLOCK, CLOSE_CON, CONTAINER, CONVERTER, CORPSE, CREATOR, DAYS_PER_WEEK, DEAD_OBJECT, DEEP_SWAMP, DETECTOR, DIRECTOR, DISEASE, DISTATT, DISTHIT, DOOR, DRINK, DUPLICATOR, EARTHWALL, ENCOUNTER, EVENT_APPLY, EVENT_ATTACKED, EVENT_ATTACKS, EVENT_BORN, EVENT_CLOCK, EVENT_CLOSE, EVENT_CONNECTOR, EVENT_CRASH, EVENT_DEATH, EVENT_DESTROY, EVENT_DROP, EVENT_GKILL, EVENT_KICK, EVENT_LOGIN, EVENT_LOGOUT, EVENT_MAPENTER, EVENT_MAPLEAVE, EVENT_MAPLOAD, EVENT_MAPRESET, EVENT_MAPUNLOAD, EVENT_MUZZLE, EVENT_PICKUP, EVENT_PLAYER_DEATH, EVENT_REMOVE, EVENT_SAY, EVENT_SHOUT, EVENT_STOP, EVENT_TELL, EVENT_THROW, EVENT_TIME, EVENT_TIMER, EVENT_TRIGGER, EVENT_USER, EXIT, FIREWALL, FLESH, FLOOR, FOOD, FORCE, GATE, GEM, GIRDLE, GLOVES, GOD, GOLEM, GRIMREAPER, HELMET, HITRUN, HOLE, HOLY_ALTAR, HOURS_PER_DAY, IDENTIFY_ALTAR, INORGANIC, KEY, LAMP, LIGHTER, LOCKED_DOOR, MAGIC_EAR, MAP, MARKER, MATERIAL, MISC_OBJECT, MONEY, MONSTER, MONTHS_PER_YEAR, MOOD_FLOOR, MOVE_ALL, MOVE_BOAT, MOVE_FLY_HIGH, MOVE_FLY_LOW, MOVE_FLYING, MOVE_SWIM, MOVE_WALK, NDI_ALL, NDI_ALL_DMS, NDI_BLACK, NDI_BLUE, NDI_BROWN, NDI_DK_ORANGE, NDI_GOLD, NDI_GREEN, NDI_GREY, NDI_LT_GREEN, NDI_NAVY, NDI_ORANGE, NDI_RED, NDI_TAN, NDI_UNIQUE, NDI_WHITE, PACEH, PACEH2, PACEV, PACEV2, PEACEMAKER, PEDESTAL, PERIODS_PER_DAY, PETMOVE, PLAYER, PLAYER_CHANGER, PLAYERMOVER, POISON, POISONING, POTION, POTION_RESIST_EFFECT, POWER_CRYSTAL, RANDO, RANDO2, RING, ROD, rt_question, rt_reply, rt_say, RUNATT, RUNE, RUSH, SAVEBED, SCROLL, SEASONS_PER_YEAR, SHIELD, SHOP_FLOOR, SHOP_INVENTORY, SHOP_MAT, SIGN, SKILL, SKILL_TOOL, SKILLSCROLL, SPECIAL_KEY, SPELL, SPELL_EFFECT, SPELLBOOK, SPINNER, SYMPTOM, TELEPORTER, THROWN_OBJ, TIMED_GATE, TRANSPORT, TRAP, TRAPDOOR, TREASURE, TRIGGER, TRIGGER_ALTAR, TRIGGER_BUTTON, TRIGGER_MARKER, TRIGGER_PEDESTAL, WAIT2, WAITATT, WALL, WAND, WEAPON, WEAPON_IMPROVER, and WEEKS_PER_MONTH. Definition at line 717 of file cfpython.c. Definition at line 499 of file cfpython.c. References cf_log(), llevDebug, llevError, llevInfo, and llevMonster. Trace a Python error to the Crossfire log. This uses code from: http://stackoverflow.com/questions/4307187/how-to-catch-python-stdout-in-c-code See also in initPlugin() the parts about stdOutErr. Definition at line 797 of file cfpython.c. References catcher, cf_log_plain(), and llevError. Referenced by compilePython(), and do_script(). Definition at line 184 of file cfpython.c. Definition at line 624 of file cfpython.c. References cf_add_string(), cf_log(), Crossfire_ObjectType, llevError, MAX_NPC, obj::name, talk_info::npc_msg_count, talk_info::npc_msgs, Crossfire_Object::obj, set_exception(), snprintf, and _cfpcontext::talk. Definition at line 732 of file cfpython.c. Definition at line 722 of file cfpython.c. Definition at line 216 of file cfpython.c. References cf_map_get_map(), Crossfire_Map_wrap(), and flags. Definition at line 420 of file cfpython.c. References cf_add_string(), PythonCmdStruct::name, NR_CUSTOM_CMD, PythonCmdStruct::script, set_exception(), and PythonCmdStruct::speed. Definition at line 120 of file cfpython.c. References cf_system_register_global_event(), cfpython_globalEventListener(), and PLUGIN_NAME. Set up an Python exception object. Definition at line 99 of file cfpython.c. Referenced by addReply(), npcSay(), registerCommand(), and setPlayerMessage(). Definition at line 602 of file cfpython.c. References cf_add_string(), cf_free_string(), talk_info::message, talk_info::message_type, rt_reply, set_exception(), and _cfpcontext::talk. Definition at line 174 of file cfpython.c. Definition at line 132 of file cfpython.c. References cf_system_unregister_global_event(), EVENT_TELL, and PLUGIN_NAME. 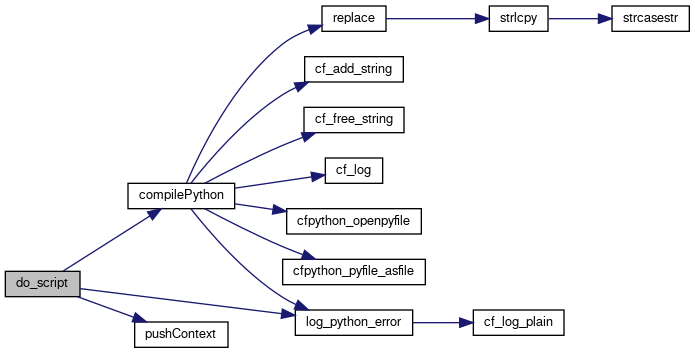 A Python object receiving the contents of Python's stderr, and used to output to the Crossfire log instead of stderr. Definition at line 789 of file cfpython.c. 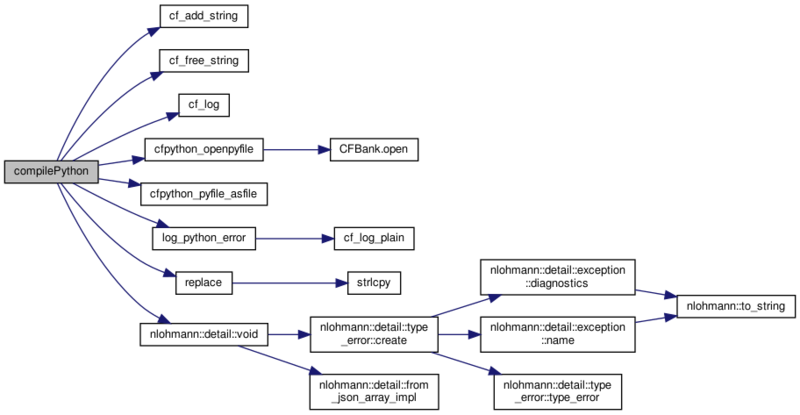 Referenced by initPlugin(), and log_python_error(). Definition at line 96 of file cfpython.c. Definition at line 665 of file cfpython.c. Definition at line 110 of file cfpython.c. Definition at line 114 of file cfpython.c. Referenced by cfpython_runPluginCommand(), and getPluginProperty(). Definition at line 112 of file cfpython.c. Referenced by Crossfire_Object_Remove(), Crossfire_Object_Say(), popContext(), and pushContext(). Definition at line 91 of file cfpython.c. Definition at line 1515 of file cfpython.c. Referenced by getGlobalEventPath(), and postInitPlugin(). Definition at line 1535 of file cfpython.c. Definition at line 118 of file cfpython.c. Referenced by getPrivateDictionary(), and initPlugin(). Definition at line 94 of file cfpython.c. Definition at line 116 of file cfpython.c. Referenced by getSharedDictionary(), and initPlugin(). Definition at line 65 of file cfpython.c.